WGN 45-10-02 Lyndonville,VT, August 30, 2013 - As reported by David Wright, President of the National Society for the Preservation of Covered Bridges, the slow collapse of the Sanborn Covered Bridge was ended by bridgewright Tim Andrews' "stone island" set in the middle of the Passumpsic River under the center of the bridge. Two 25 Ton hydraulic jacks atop a cribbing built on the "island" exerting 35 to 38 Tons of lift, raised the bridge approximately 25 inches to the horizontal. With the bridge in position, the broken chords can now be re-enforced with 5" x 12" x 42 foot timbers, completing the stabilization project. With the bridge stabilized, it needs to be removed from the river and set two to three feet above the ground to await further restoration. The cost of the stabilization is estimated to be $65,000 and removal activity may coat as much as $275,000 but perhaps less. The restoration phase has not yet been estimated. To build the "island," 20 cubic yards of stone were brought to the site. Two thirds to three quarters of this was used, carried to the river by hand in buckets, all of which is required to be removed from the river by December 1, it is assumed, by hand in buckets. Tim Andrews of Barns and Bridges of New England, was assisted by volunteers John C. Hayden, J.C. Hayden, and Evan Andrews. Lyndonville,VT, August 27, 2013 - Permits to work in the Passumpsic River streambed have been received from both the State of Vermont and the U.S. Corps of Engineers. 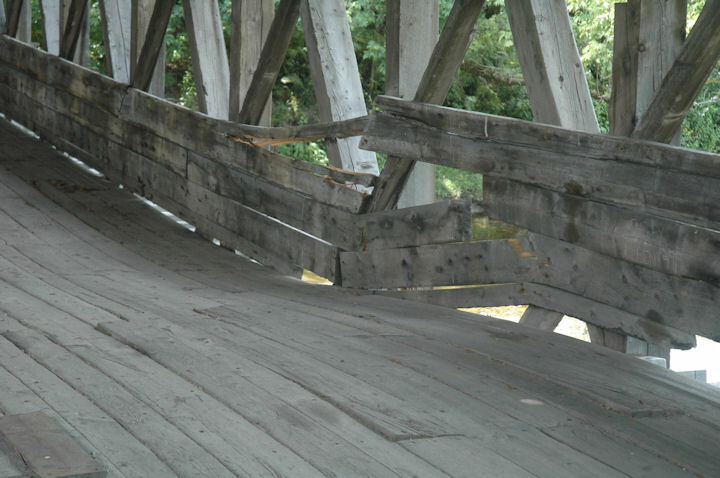 The question of insurance is closed, SO Bridgewright Tim Andrews will begin work tomorrow morning by shoring up the collapsing bridge with timber. A platform of boxed stone will be built up from the stream bottom from which the bridge can be jacked up for the repair of the broken chords. Andrews estimates the stabilization work to cost between $12,000 to $16,000. The permits require that the streambed must be cleared by December 1. 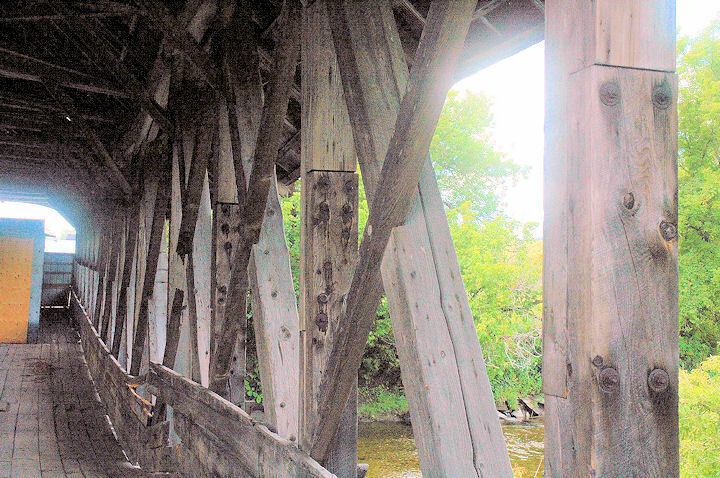 On August 11, a team committed to the rescue of the failing Sanborn Covered Bridge gathered at the bridge site; David Wright, President of the National Society for the Preservation of Covered Bridges; Tim Andrews, of Barn & Bridges of New England; Jan Lewandoski, of Restoration of Traditional Building; Eric Gilbertson, of the Preservation Trust of Vermont; Joe Nelson, Vice President of the Vermont Covered Bridge Society; Arthur Elliott, owner of the bridge; and others. 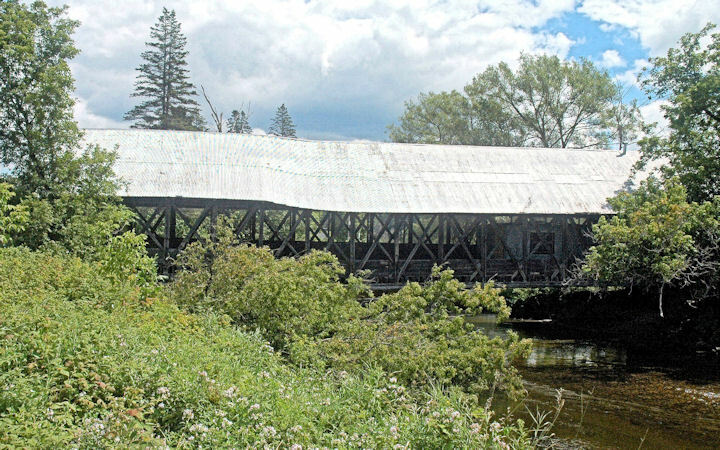 Both the upper and lower chords of the downstream truss are broken and that side of the bridge is kept from collapsing into the Passumpsic River by the bridge flooring and roof system held in place only by the upstream truss. It was immediately apparent that the first order of business is to "stabilize" the bridge. A plan was proposed in which support from below will be established from which the bridge can be jacked back up into position so the broken chords can be repaired. Bridge wright Tim Andrews is began calculating the cost of the stabilization while, Eric Gilbertson is seeking funds and permits. 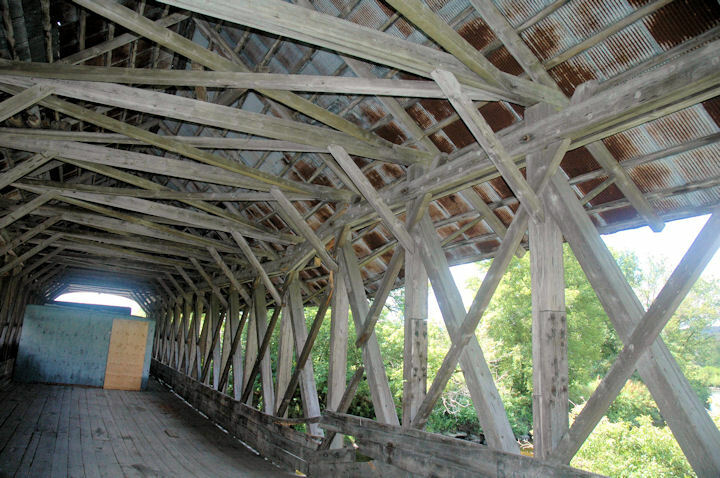 The Sanborn Covered Bridge is the last example of the Paddleford truss at the pinnacle of its development in Vermont. According to research done by Richard Sanders Allen, it may possibly have been built by Peter Paddleford's son in 1869. 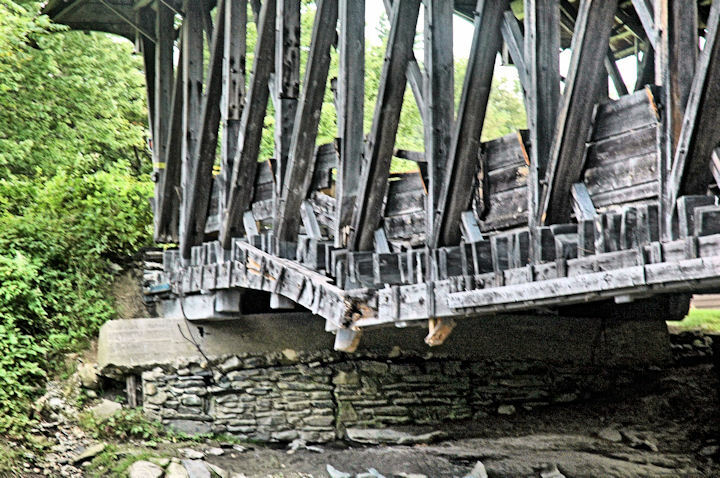 When the bridge is gone, an important portion of Vermont's inheritance will go with it. 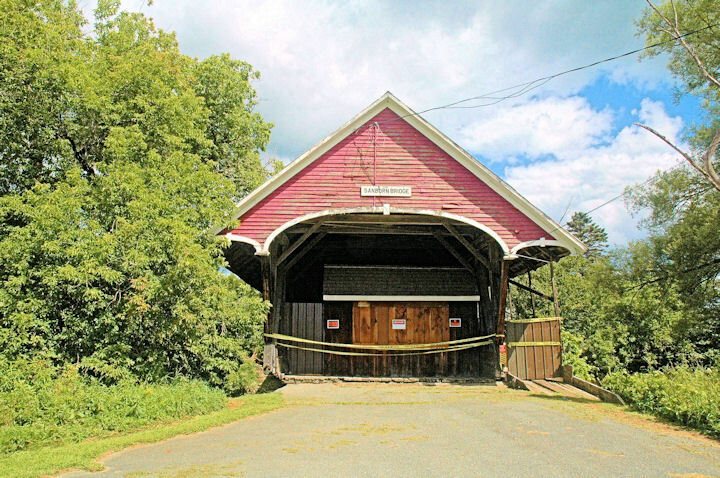 After the flood of 1927 and probably also due to the "modernization" of our bridges, by 1997 there were only three Paddleford structures left in Vermont. In November of that year, the Irasburg bridge, 45-10-02, was lost to arson. It was replaced with a replica using a non-historic version of the truss. The other Paddleford is the privately owned Lords Creek Bridge, 45-10-01, in the last stages of decay. The Sanborn or Center Bridge closed to all traffic by police. The bottom chord of the downstream truss is broken at the end of the bolster beam. The upper chord of the same truss is also broken. A view of the bridge deck and siding at the break in the downstream truss. A view of the broken upper chord. Three broken counter braces and numerous broken away kingpost knobs (the last not shown).